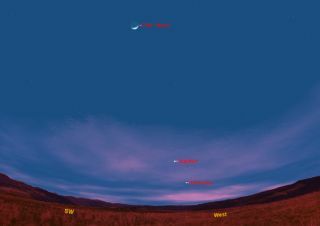 This sky map shows how the Jupiter, Mercury and the moon will appear at 6 pm ET pm March 10, 2011. It will soon be time to bid a fond adieu to an object that has been a fixture in our evening sky since the start of last fall: the planet Jupiter. Jupiter is leaving our nighttime skies after many months of impressive display. Currently, it’s setting about two hours after the sun and you can still see it quite easily, albeit rather low in the western sky as early as 30 to 40 minutes after sunset. You can't miss Jupiter on a clear night. It's the brightest "star" in the area. On Sunday evening (March 6), weather permitting, skywatchers will be treated to a lovely celestial tableau, as a very narrow crescent moon – less than two days past new phase and a mere 4 percent illuminated – sits on a line about 6 degrees to the right and slightly above Jupiter. Remember that your clenched fist, held at arm’s length measures roughly 10 degrees. So Jupiter and the moon will appear to be separated by a little more than half a fist. The slender sliver of the moon will almost seem to mimic the grin of the invisible Cheshire cat from Lewis Carroll's "Alice's Adventures in Wonderland." With each passing evening, Jupiter will drop a little lower into the sunset glow. Beginning Thursday evening (March 10), another planet will begin climbing out of the solar afterglow: Mercury, which edges up above the western sunset horizon to shine with Jupiter around the middle of the month. The skywatching map here of Jupiter, Mercury and the moon shows will appear on March 10. Look for Mercury about 7 degrees below and to Jupiter’s right. For the several days it continues to climb higher while Jupiter sinks lower. Mercury will be glowing at a bright magnitude -1.3 on the reverse scale used by astronomers to measure the brightness of sky objects. That makes Mercury just a trifle dimmer than Sirius, the brightest star in the night sky, but it will appear only half as bright as Jupiter. Pay special attention to the changing celestial scene on the evenings of the March 14, 15 and 16, as Mercury and Jupiter pass each other; one going down while the other is coming up. On these evenings, about 30 to 40 minutes after sunset, Mercury and Jupiter will be standing about 10 degrees above the western horizon. On March 14, Mercury will appear to the lower right of Jupiter. They will be closest together on the evening of the March 15, appearing almost side-by-side and separated by just 2 degrees. The next evening, Mercury will appear to hover above and to Jupiter's right. While it goes without saying that clear skies are certainly a prerequisite for naked eye views of Mercury, the smallest planet passing the largest, you’ll be able to enhance your visibility by using binoculars. On March 17, Jupiter arrives at perihelion for the first time since 1999. This is the closest Jupiter gets to the sun in its nearly 12-Earth-year orbit, a distance of 459.94 million miles (737.74 million kilometers). According to the Observer’s Handbook of the Royal Astronomical Society of Canada, the 2011 perihelion of Jupiter is "… by a small amount, its smallest perihelion distance in over half a century." By March 21, Jupiter will stand only 5 degrees above the western horizon a half hour after sunset. The big planet goes down only about 55 minutes after the sun and is becoming increasingly difficult to see in the bright twilight glow. In another day or two after that, Jupiter will be gone. It will be in conjunction with the sun on April 6, transitioning into the morning sky, where it will reappear at dawn early in May. So for Jupiter this is not really a "good bye," but only a "farewell" until later in the spring. As American writer Richard Bach so aptly put it: "Don't be dismayed at goodbyes. A farewell is necessary before you can meet again."